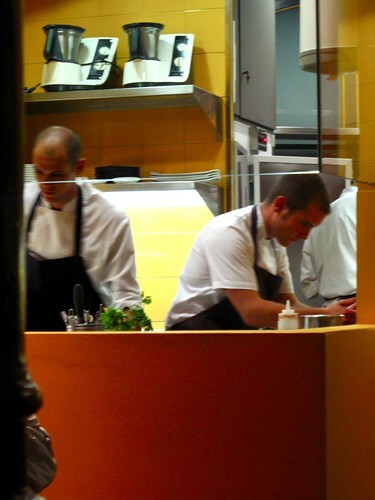 Last night, I had an eye-opening meal here in Barcelona--one that was spectacular enough to catapult me back into blogging. I've had some awful touristy meals as a result of time constraints and convenience, but I've also had some pretty damn good tapas. However, nothing had really compelled me to rush home and blog about it. Then, along came Comerç 24. I knew it'd be Spanish influenced cuisine with a liberal dosing of molecular gastronomy, but it was beyond anything I expected. 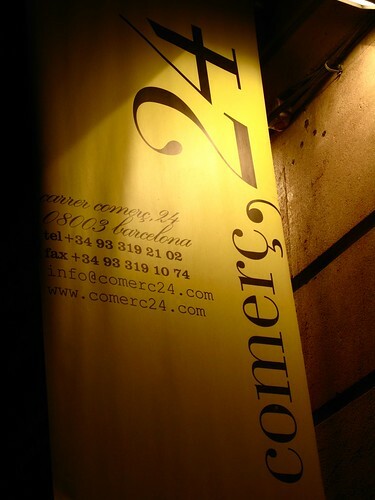 After a short metro ride and a nighttime stroll past the city's Arc de Triomphe, the glowing bright yellow banner of Comerç 24 beckoned me into a dark, yet inviting street. We were just in time for our 10:15pm reservation. All the shops and stores around the restaurant seemed to be closed--the only bright light coming from within the restaurant. We entered and were immediately seated at the largest table in the middle of the room. And open kitchen occupied one side of the room and a beautiful bar the other. Obviously I opted for a clear view of the kitchen. Immediately, one can sense the immaculate precision of the kitchen--everyone was busy doing their tasks, but there wasn't even a hint of chaos. My kind of kitchen. 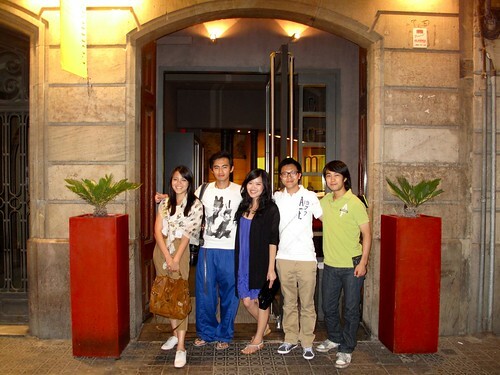 I went with a group of fellow students also in the business travel study program with me here in Barcelona. The tasting menu at Comerç 24 is pretty pricey for a student budget (72 euros for the shorter FESTIVAL menu), but I managed to get together five of us who were willing and able to spend that kind of money on food. We had some spherification virgins in the group and let's just say the expression on someone's face when they pop their first spherification is priceless ;) None of us left disappointed. I don't know about them, but I left with a whole new perspective on what food can be. 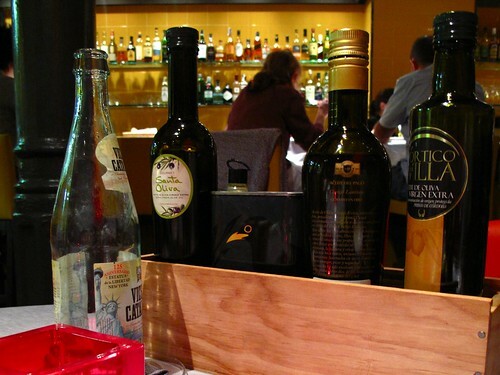 A bread basket and box of olive oils were brought to our table. 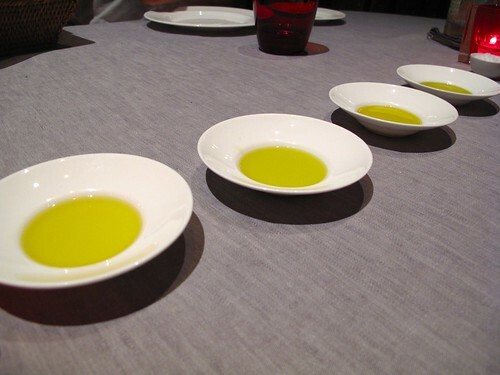 As the server explained each olive oil in the box, he pour, in a long stream, the vibrant green oil into four different dishes--in order from lightest to strongest. 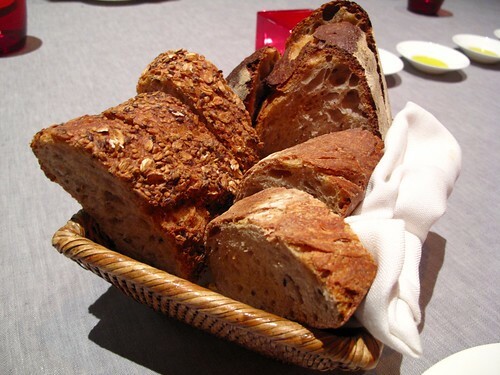 I enjoyed dipping each bite of the rustic sliced bread into different pools of fruity oil before deciding that the strongest was the best. To start, these adorable filo "cigars" were delightful. 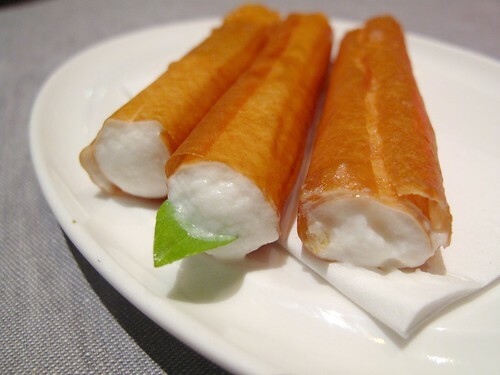 With a remarkably thin, crunchy, slightly thin wrapper and a filling of mousse-like parmesan cheese flavored with lime and basil, they left everyone wanting more. 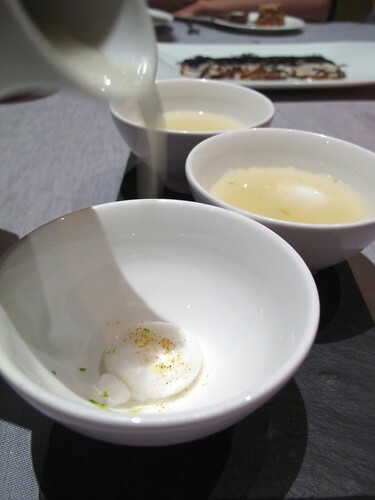 Served in little teacups with a pearly white spherification at the bottom, a chilled broth was poured into the cup at the table. With the first cool sip, I was reminded of Thai flavors, of lemongrass and kaffir lime. 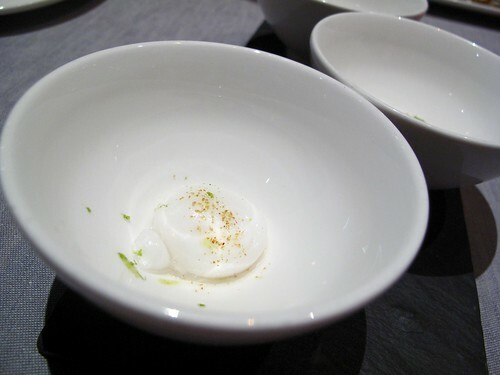 When the spherification rolled into my mouth, a gentle squeeze against the roof of my mouth resulted in the release of slightly sweet coconut milk. Definitely Thai. This was the first dish that knocked me off my feet. It was remarkable. Not only delicious but also unbelievably beautiful. Someone compared it to a Chinese watercolor, and I couldn't have agreed more. I watched as the kitchen literally painted the plate with a jar of black sesame paste "ink." The seared monkfish, still rare and translucent at the center, had a salty, briny taste that paired so surprisingly well with the nutty, savory sesame. I didn't quite catch what kind of fish topped this innovative pizza but we deduced that it was some kind of smoked, salty fish--maybe a spanish mackerel? 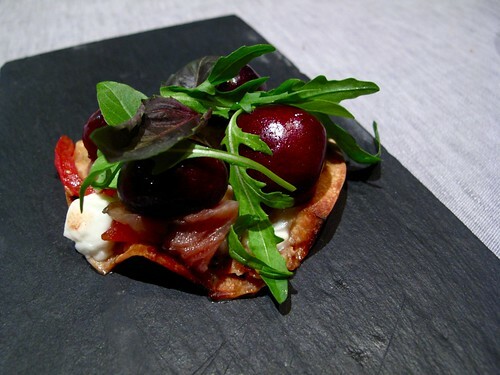 The little pizza had toppings of a white, fresh, crumbly cheese, oven roasted cherry tomatoes, baby arugula, and pitted cherry halves on a thin, crispy crust. Our server used a cute little pizza cutter to cut it into four pieces. The sweet bit of cherry went well to balance the fishy, smoked flavor. The first actual dish in the 7 savory courses, it blew me away. I love sardines and anchovies and all small salty fishes. This was the best preparation of sardines I've ever had. The slivers of sardines were accompanied by fresh citrus segments to cut the fishiness, with slightly sweet and crunchy crumbles creating a contrast in texture. 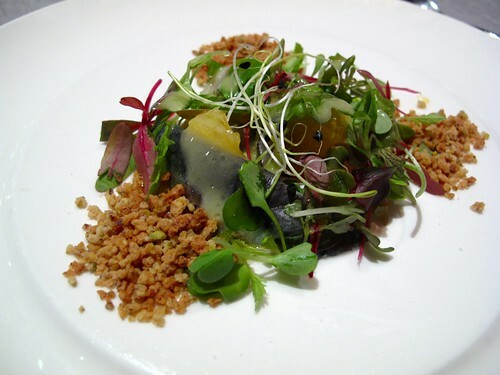 The micro greens added a touch of freshness to the dish. It just worked. I was not particularly impressed or surprised by the tuna tartar. 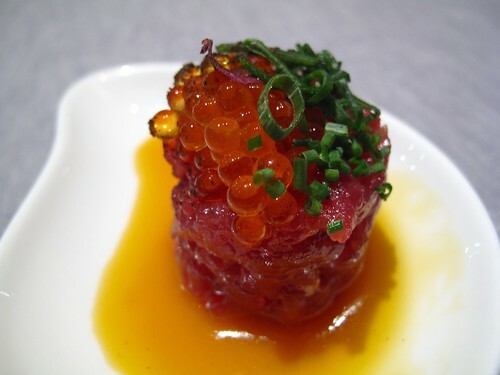 It tasted exactly like how it looked--raw tuna, lightly marinated in soy sauce topped with salmon roe. The only interesting component was the sauce of raw egg yolk. I've only had raw egg yolk with beef tartar...never with tuna tartar. Absolutely beautiful, this soup looked like a work of art. 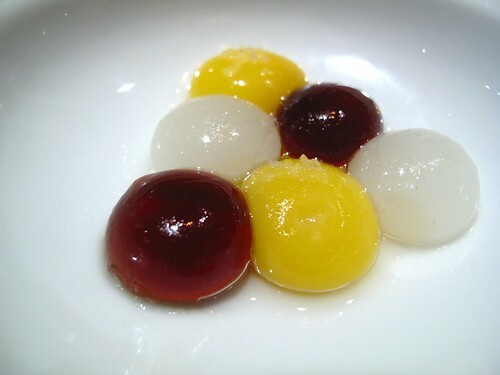 Three different colored spherifications, each containing a different flavor (the yellow being egg, brown being truffle, and white being parmesan) it was arranged into a colorful pyramid. 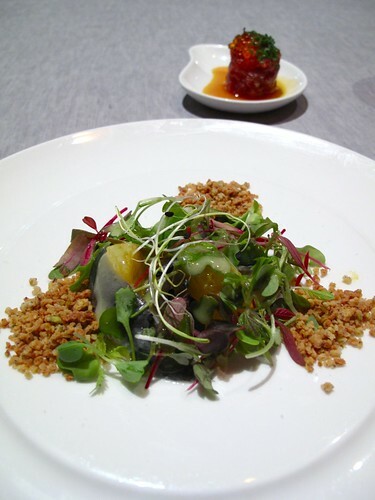 A delicate sprinkling of sea salt adorned each of the egg spherification. 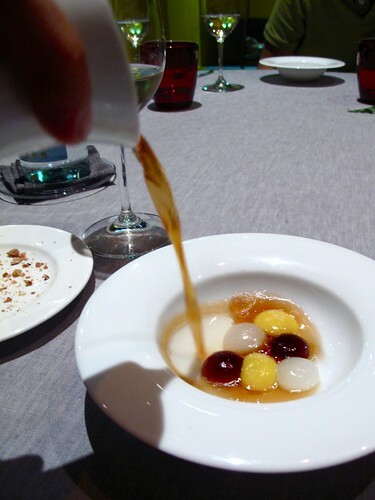 Then a warm, wonderfully scented, black truffle consommé is poured over the spherifications. 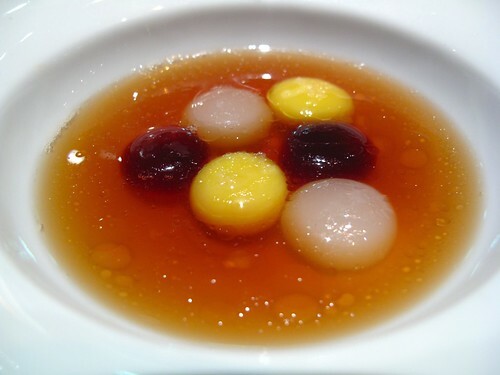 We were advised to eat each spherification separately, resulting in a different flavored bite each time. It was not only delicious, but also such a joy to eat. 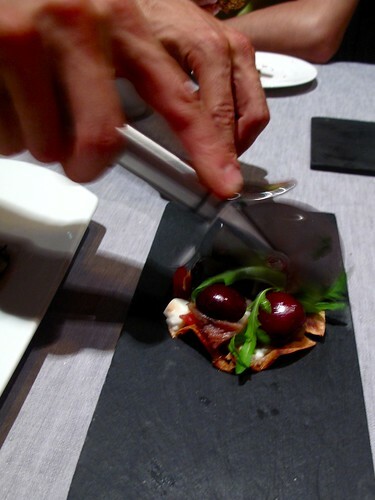 Another gorgeously plated dish--I love the use of a piece of slate as a plate. 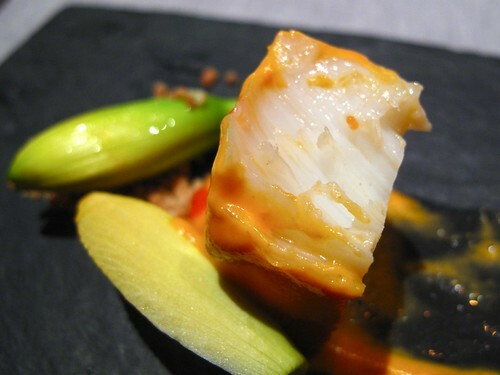 A bright orange romesco sauce covered a moist, flakey piece of salted cod. 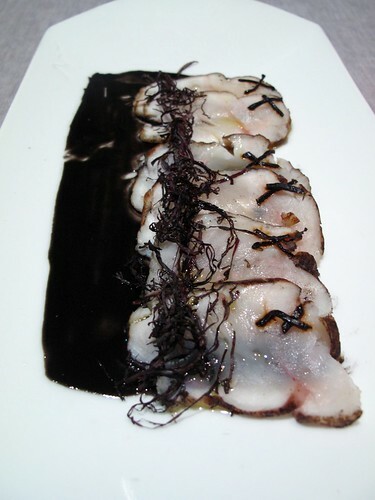 Carquinyolis, which is apparently a Spanish version of biscotti, left a trail from the cod to a piece of edible flower that reminded of a asparagus. 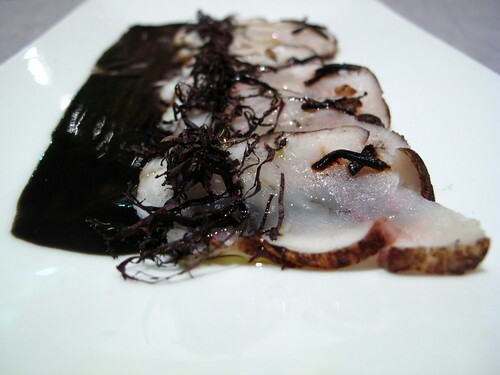 Taken together, it was a very interesting preparation of fish. However, I would've liked some acidity. The sweetness of the biscotti crumble and the saltiness of the fish were not enough. How could this dish not be good? It was amazing. Each grain of rice was cooked to a perfect toothsome al dente in a duck stock. There were no actual pieces of duck in the dish but it's essence was definitely there. 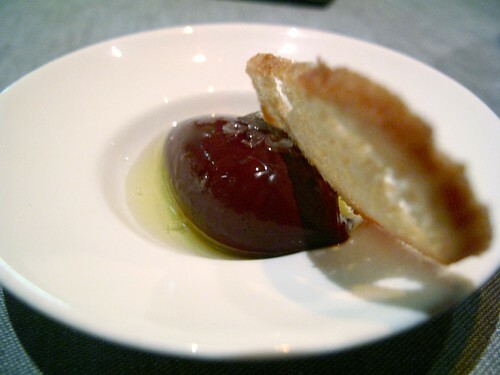 The quenelle of foie gras was so rich and smooth. We were advised to mix everything together before eating. 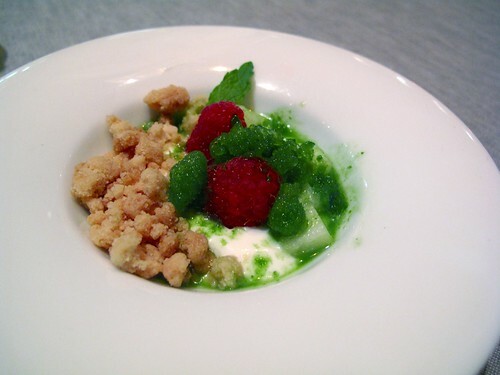 Unfortunately, there was also a kind of crumble in the dish--one that tasted like crushed corn nuts to us--and it's flavor was a little overpowering for the foie. Such interesting plating. 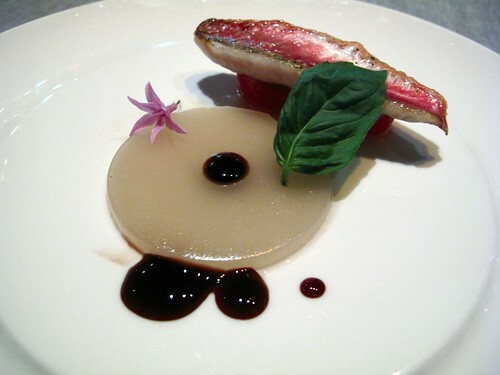 The translucent disk is solidified fish stock made from the bones of the red mullet. A single leaf of basil and a surprisingly pungent purple flower (reminded me of garlic and chives) adorned the plate. The drops of sweet, thick balsamic vinegar provided the acidity I tend to enjoy in fish dishes. The red mullet, apparently from Chiavari, was cooked to a tender, juicy doneness. 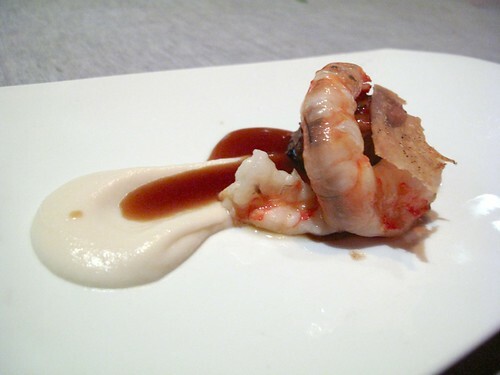 The last savory course, was a perfectly cooked piece of prawn. I've never had prawn so sweet and succulent. It's snappy texture reminded me of perfectly cooked langoustine...only better. 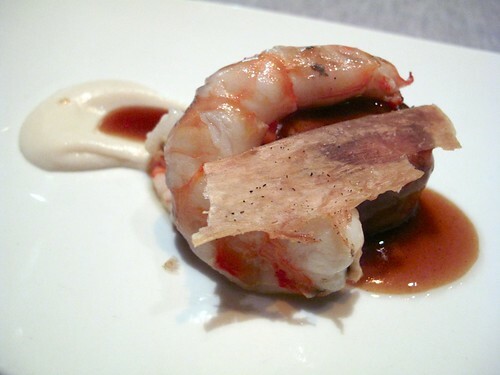 The chicken thigh meat underneath was definitely not as memorable compared to the prawn. It was a little heavier than previous dishes so it was a nice conclusion to the savory portion of our meal. This unassuming shot of orange colored juice and green foam is a lot more impressive than it seems. We were told to take the entire shot of white peach juice, lemon zest, and green tea foam in one gulp. We all thought it was a questionable combination of flavors, but as we said cheers and all started drinking the shot, everyone's eyes started to widen in surprise and then in awe. It was an amazing shot of juice. 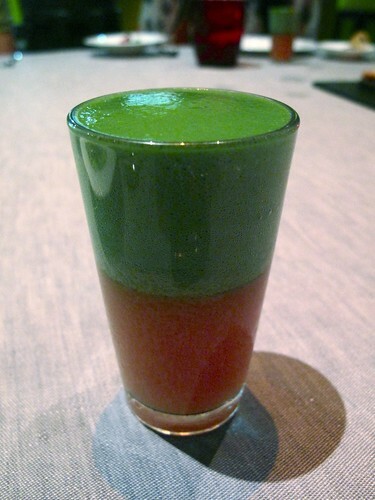 The white peach juice was sweet and pure, and the matcha foam was a pleasantly bitter contrast. It was ridiculously good. Ridiculous. A smaller portion of the same dessert I had at the more casual Tapaç 24, the combination of chocolate mousse, fruity olive oil, and sea salt works so surprisingly or not so surprisingly well. Great for a chocolate lover like me. A light and fruity dessert offering, it was slightly unmemorable when compared with the rest of the meal. Vibrantly green, though not much else. It tasted like yogurt with some fruit and crumble. 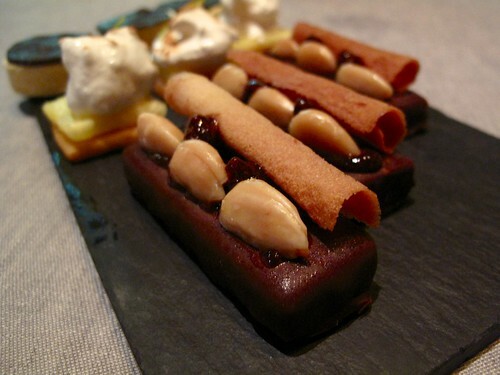 A cute little offering of mignardises came on another black slate. However, at this point, we were all too full to really appreciate them. That being said, they were all delicious. Of course I still managed to eat my share. 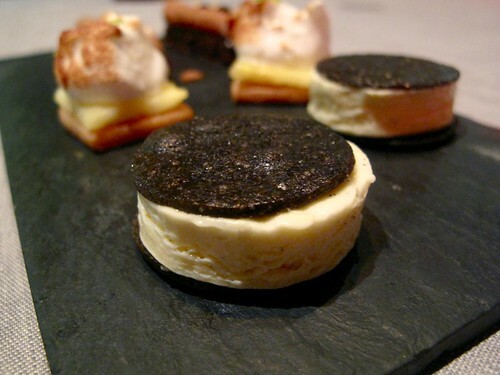 The black sesame oreo ice cream sandwich was cute--something I might want to replicate at home. The pineapple treat tasted like a Chinese pineapple cake/tart/thing (hopefully someone out there knows what I'm talking about) just more delicate and with a hint of lime zest. The nougat tasted like some kind of chocolate bar. When Carles Abellán come up with the concept of Comerç 24, he himself wasn't quite sure how to describe it. While the chef is Catalonian, the food isn't decidedly Catalan. 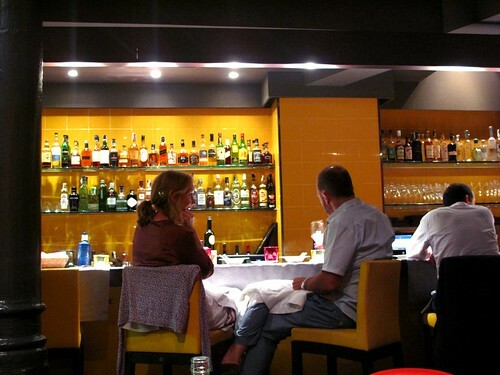 While it bills itself as a tapas restaurant, it's dishes don't really resemble traditional tapas fare. 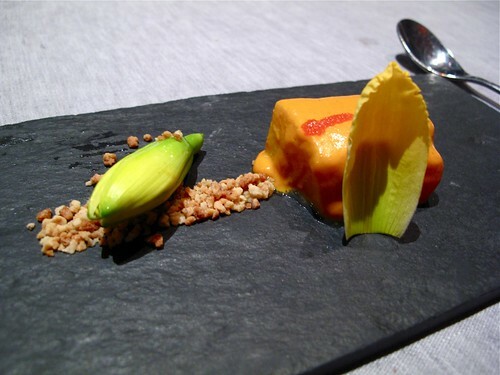 The food leans so heavily on molecular gastronomy, it's hard not to rest on the fact that Abellán was a pupil of Ferran Adrià. Still, it was a dining experience unlike any I've ever experienced before. With attentive service that was there for me with my every bite, I'd never been so perpetually surprised and challenged by every dish. Everything I ate was like a new discovery for me. simply amazing. love your blog. visit mine and give pointers please! Awesome, awesome post. Thanks for sharing! I'm glad someone took pictures! I had basically the same meal at Commerc 24 tonight. I;m sitting here in my hotel room trying to jot down all the courses - you filled in some of my questions about ingredients and flavors. I was by myself at the bar & I wisely let the sommelier choose a series of wines by the glass to go with the courses - it alone was worth the visit. Tart sauvignon blanc with fresh sardines & orange salad, a nutty Amontillado sherry with the duck rice with foie gras (incredible! ), and a smokey tempranillo with the romesco covered cod and a piece of ox sirloin with turnips and dots of wasabi. Then the deserts were just the mind-blowing little bombs of flavor needed to finish me off. I have died & gone to foodie heaven. Wow, like you I also went to L'Avant Gout in Paris a few years back. Thanks! P.S. My recollection of the pineapple desert (and I think it was my favorite of the umpteen little deserts they gave me - I also go little chocolates with my coffee, like a gold covered block with creamy filling and a green tea white chocolate square!) Anyway, I remember them pouring a ginger tea over a tiny stone bowl with a piece of cake (almond maybe) a slice of pineapple and a dollop of lemon sorbet - the marriage was bursting with fresh fruit flavor.